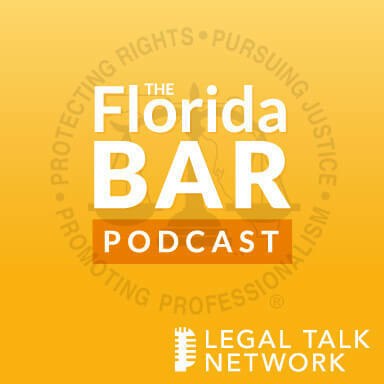 In this episode of The Florida Bar Podcast from the 2017 Annual Florida Bar Convention, hosts Christine Bilbrey and Jonathon Israel talk to Suzanne Clark and Park McManis about electronic discovery and digital evidence. Their discussion includes why it’s important for lawyers to know about e-discovery and resources for those interested in using e-discovery, including the Association of Certified E-Discovery Specialists. Suzanne Clark concentrates her legal practice in commercial and business litigation and cybersecurity law. Parke McManis is an attorney, MBA, Relativity Certified Administrator (RCA), and Certified E-Discovery Specialist (CEDS). Christine Bilbrey: Hello and welcome to The Florida Bar Podcast, brought to you by The Practice Resource Institute on Legal Talk Network. This is Christine Bilbrey, recording from the 2017 Annual Florida Bar Convention in Boca Raton, Florida. Jonathon Israel: And I am Jonathon Israel, Director of the Florida Bar’s Practice Resource Institute. Thank you for joining us today. Christine Bilbrey: So in this segment we have Suzanne Clark and Parke McManis and they spoke just a little while ago to our CLE attendees here at Boca Raton all about E-Discovery Digital Evidence. So I want to start with you Suzanne, tell our listeners where do you work and what do you do? Suzanne Clark: I am an Associate Attorney at Jimerson & Cobb. We are a commercial litigation firm in Jacksonville, one office firm, ten attorneys. And I specialize in commercial litigation, but I also deal in electronic discovery, so whenever any of the attorneys at the firm have an issue with the data in their case, I get to come in and be involved and I do a lot of liaisoning with the project managers and E-Discovery vendors that we need in order to handle our data and our clients’ data. Christine Bilbrey: Okay. And Parke, where do you work and what do you do? Parke McManis: Yeah, I work at Complete Discovery Source. We are an E-Discovery service provider. We are headquartered in New York and then I am the Managing Director of the Washington D.C. office. We specialize in large scale litigation, very highly consultative, and I just came down for the event from D.C.
Christine Bilbrey: And we are glad you did. Christine Bilbrey: So we have attorneys that are all different levels of tech savvy, so how did you kick this off today in the CLE, what were the important things that you wanted to share with those that are waiting in and those that know? Suzanne Clark: Well, we knew this was a basics course and a technology course, especially now that we have a technology CLE requirement, which is very exciting for us techie attorneys, so we wanted to give a very broad overview of the Electronic Discovery Reference Model and then get a little more granular on each stage of the Electronic Discovery Reference Model, which is the EDRM. So we went through the technology that’s involved and Parke handled a lot of that, and then I dealt with the Florida Bar rules and case law and attorney aspects of the EDRM. Parke McManis: Yeah. And kind of coming into it the idea was to be an E-Discovery 101 type course, kind of intro to E-Discovery, because E-Discovery is not really something that most attorneys deal with, and if it is presented to them, they are not super excited about learning about it, so it can be a little intimidating as well. So the idea was really just to give a real intro level, and for someone who knows nothing about E-Discovery or has maybe heard the words but have no idea what they meant, to give them — try to translate it for them and give it to where now they at least know a base level and can have an intelligent conversation about E-Discovery with their colleagues and more importantly with opposing counsel. Christine Bilbrey: Right. And there are a lot of requirements for preservation of — so even if you think you are not going to be involved in E-Discovery, there are those responsibilities if you — I think that a lot of times people thought E-Discovery was for like mass litigation, tort kind of things, but now you could be a family law attorney and you need to get information off of Facebook or a cellphone and so it’s touching everyone now. Is that what you are finding Suzanne? Suzanne Clark: Oh yes, absolutely. We did talk a little more about the idea, if you get hit with a big case; we brought in some other aspects of it. The big thing for smaller cases is going to be mobile device discovery, that’s in personal injury actions and family law actions, so like you said, preservation is very important, you need to be advising your clients of their duty to preserve as soon as they are anticipating litigation, which has been the federal court standard for some time, but recently there’s case law in Florida where anticipation of litigation is when you need to start your duty to preserve and advise your clients of that. Parke McManis: Yes, and like Christine said, a lot of people think of it as a very large-scale litigation type thing, but really anything that involves any sort of electronic evidence, which think about these days, everyone has email accounts, cellphones, there’s actually a whole — this isn’t something that we dive too deep into, but there’s whole Internet of Things out there that even the E-Discovery industry is figuring out how to discover. I think there’s already been a case where someone tried to subpoena information from the Amazon Echo. There’s been cases where Fitbits have been introduced into evidence to prove where someone was when a murder took place and what level of activity they were doing. I mean we are all connected with technology. So we have had some cases that are small, just a few hundred documents or maybe just a cellphone; we had one case where it was just a cellphone, they needed to extract out the text messages, and we took a cellphone in and gave them just an Excel spreadsheet of a few hundred text messages. So it can be pretty much anything that’s electronic; it can be large or small. Christine Bilbrey: And so when someone is jumping into this, I think the other — besides the fear of technology is the fear of the cost, so if someone is coming to your company and they are a solo and it’s something like that — I think they are worried that when they come to you, you are going to say we don’t do that small potatoes work, so you don’t know where to go. So what do you tell the attorneys that were in here, like where should they start, is it based on the size of what they are dealing with? Parke McManis: The size is what comes into play with the overall cost, because it’s usually a per gigabyte cost, but there really is no case too large or small, and in fact, if it’s very small, then that’s better for you, because like I said, they charge per gig. So no matter how small it is, you reach out to a service provider, and if it’s something — some people just specialize on extremely large-scale and if they do and they don’t want to deal with a case that small, they will have someone to reference you to, but most people, there’s no too large or too small. Jonathon Israel: What are some of the tools you see people out there using to try and actually collect and aggregate this data? I mean as you said, it’s rapidly evolving, you have got apps coming out by the day that people are using to communicate and store stuff, I mean how do you keep up with it, where do you even go to find this? Parke McManis: So Legaltech is an event that we went to, that was in New York this year, and that’s one of the things they talk about, these technology in the law type events, and that’s the thing as a new app comes out, you have to figure out how to collect the data. And so when the app comes out, no one has even looked at the app, much less figure out how to break it down and collect from it and all that stuff. So that’s really at the leading edge. So, even a lot of the experts don’t know the answer to some of those questions, as far as the leading edge type stuff. But really, you reach out to anyone who is an E-Discovery professional and most of the time they can tell you where to start with the basic things; email, computer, that type of stuff, because there are special tools that can go into cellphones or computers and draw the information out. Suzanne Clark: Also, we have professional organizations, so the Association of Certified E-Discovery Specialists, which is ACEDS, and our website is aceds.org. Parke and I are both members. We have an annual conference, we have local chapters; Jacksonville has a chapter of ACEDS, D.C. has a chapter; Parke is on the DC board, I am on the Jacksonville board. So the great thing about ACEDS is it brings together professionals that are service providers, records management people, attorneys, paralegals, and we get together at these conferences. ACEDS does webinars. They do training; both Parke and I are certified E-Discovery Specialists. So when you get in an organization like that, you are able to talk to your peers and find out the questions. So I would definitely refer people to aceds.org if they are looking to solve their E-Discovery problems and they will be able to navigate through it. Jonathon Israel: That’s good to know. Christine Bilbrey: Yeah, that’s a wonderful resource. So our listeners are going to have more questions, so if they want to find you, what is your website? Parke McManis: We are cdslegal.com. My name is Parke McManis. Like I said, I am the Managing Director of the D.C. office; we are headquartered in New York. You can find all the contact information on there. There’s an option to go ahead and get information about your case, you can submit it right there on the website. Complete Discovery Source is the name, cdslegal.com is the website. Christine Bilbrey: Wonderful. And Suzanne. Suzanne Clark: Jimerson & Cobb is my law firm and also, I am happy to connect with anyone on LinkedIn, if you want to just private message me, I will respond. I love talking about electronic discovery. Christine Bilbrey: Excellent. Well, this has been another edition of the Florida Bar Podcast, brought to you by The Practice Resource Institute on Legal Talk Network. I want to thank our guests, at the end of the day, we really appreciate it. It’s been a long day here, but we got a lot done. And if you liked what you heard today, please find and rate us on ITunes. I am Christine Bilbrey. Jonathon Israel: And I am Jonathon Israel. Until next time, thank you for listening. Outro: Thanks for listening to The Florida Bar Podcast, brought to you by The Florida Bar’s Practice Resource Institute and produced by the broadcast professionals at Legal Talk Network. If you would like more information about today’s show, please visit legaltalknetwork.com. Subscribe via iTunes and RSS. Find The Florida Bar, The Florida Bar Practice Research Institute and Legal Talk Network on Twitter, Facebook and LinkedIn, or download the free app from Legal Talk Network in Google Play and iTunes.